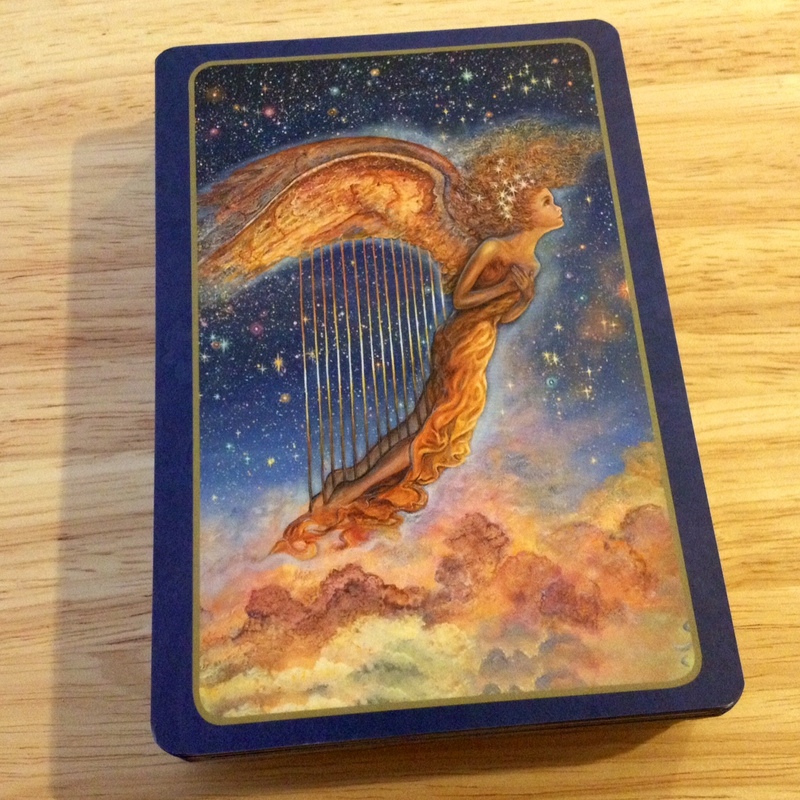 Whispers of Love is my first Blue Angel oracle deck that comes with a matte finish instead of the usual high gloss and I am loving it. I hope they stay with this finish and subsequent decks are printed in matte. The feel to the touch is fantastic; shuffling is fantastic; I love the swishy sound these matte finished cards make compared to the tacky-sticky glossed ones; and they photograph beautifully, with no glare. Here is one high-quality deck and I am thrilled. 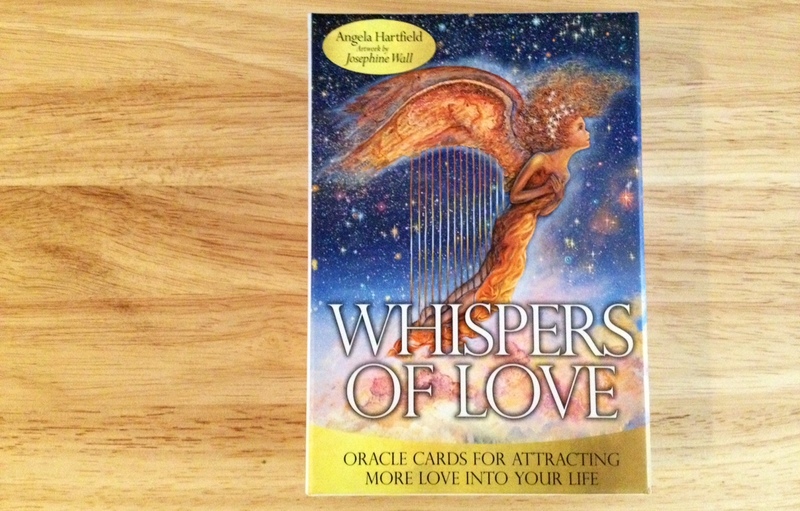 Hartfield created Whispers of Love to bring insights and messages for building stronger interpersonal relationships. This is a deck about relationships, though not necessarily romantic. If you’re trying to make sense of your relations with a colleague at the office, why your boss is acting the way she’s acting, or how to handle a minor dispute with your neighbor, this would be a great deck to reach for. 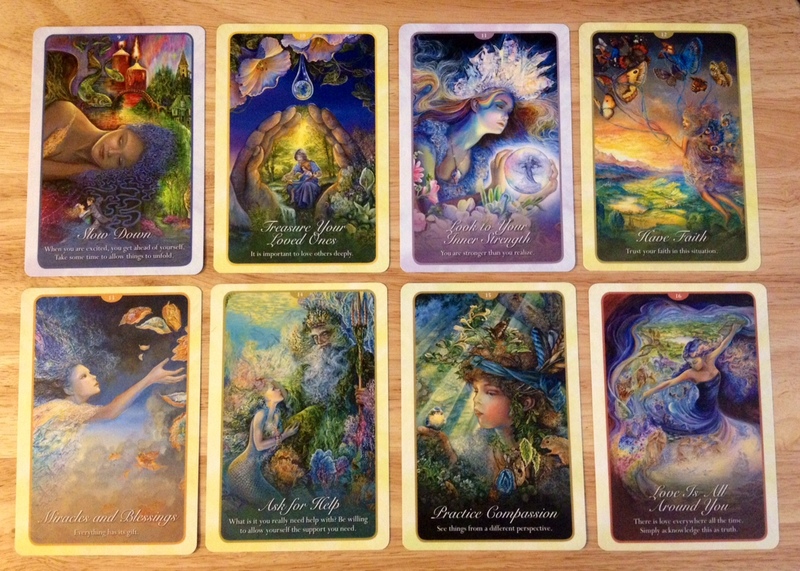 Of course, if you’re seeking guidance on a romantic relationship, then this would be your deck. The card backs are not reversible, which makes sense because this deck doesn’t seem intended to be read with reversals. The card backs are the same imagery as Card 20, “I Love You,” and reinforces the theme of the deck, though I would have liked to see a different work of art used for the card backs. Here you’ll also see the detailing in the borders. Adding that extra thinner border line between the art and the thicker border on the edge balances out the entire deck aesthetic. I appreciate that attention. Josephine Wall, the artist for the deck, paints in a dream-like fantasy style that is a perfect complement to Hartfield’s spiritual point of view. The art for this deck are done in acrylics on canvas and are just magnificent to behold. There are 50 cards in total, diverging from comparable decks on the market, like Doreen Virtue’s angel oracle decks, which frequently feature 44 cards. See Card 1, which begins the ascent of the cards: “Listen with your Heart.” It expresses a recurring theme of the deck, which is to use this deck to help open up your heart chakra, to be empathetic and compassionate, and to make decisions through your heart rather than through your mind, especially when inquiring about relationships. Then there’s Card 8, “Love Who You Are,” and on that note, many of the cards are about self-love, reminding the seeker that loving yourself is the first step to loving others. The corresponding entry in the guidebook, a short and sweet entry that is only about 5 sentences long, maybe 50 words total, urges the seeker to be confident and follow dreams. Lovely, saccharine sweet messages, and yet sometimes, those really are the messages that seekers need to hear. Speaking of Doreen Virtue, it’s going to be hard not to draw comparisons between Hartfield and Virtue. Both espouse messages believed by them and their followers to be communicated directly from angels or angelic beings that seem culled from the more universal aspects of all religions, which is to be kind, be compassionate, respect yourself your body is a temple, and to put your trust in greater divine forces. What makes the Whispers of Love deck by Hartfield stand apart from Virtue oracle decks is the cohesiveness of the artwork. 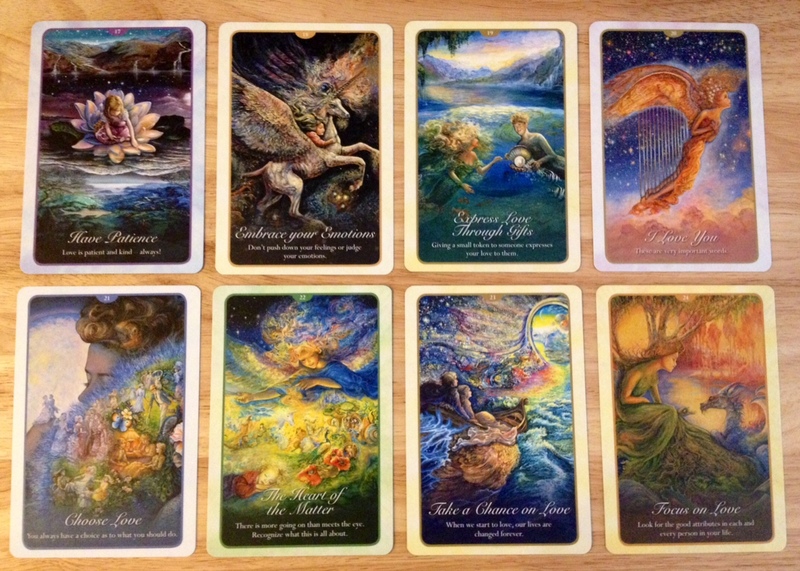 I love, love, love that the publisher opted for a single artist, Josephine Wall, rather than compile a hodge podge of artists that often result in a disjointed vibe in the oracle decks that feature multiple artists. 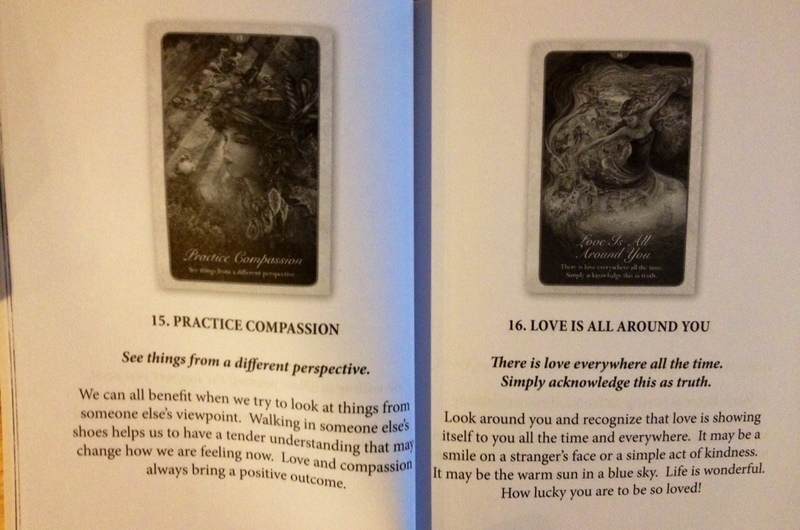 So I very much appreciate the publisher’s hand in preserving artistic cohesiveness in the Whispers of Love cards. 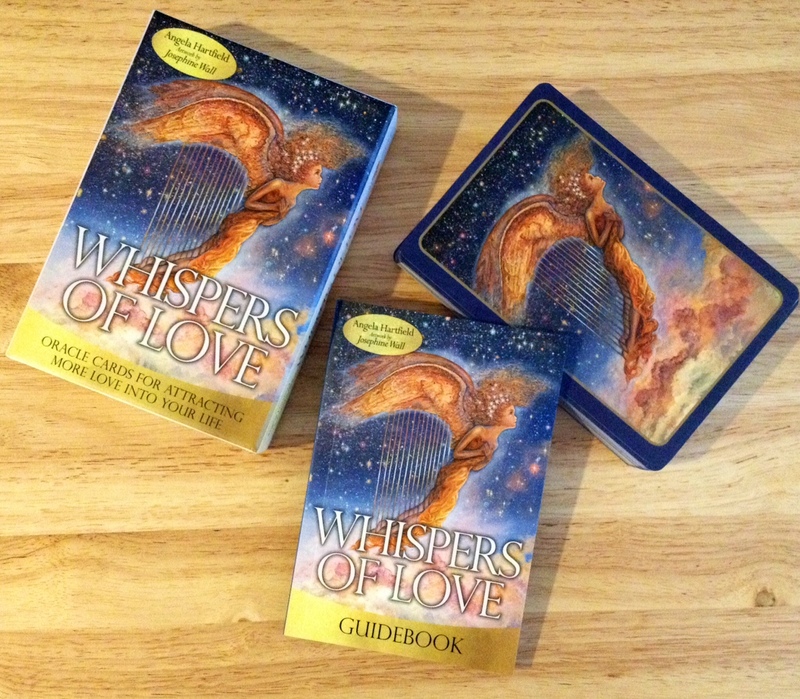 In comparison to, say, Alana Fairchild, another big name player in the feel-good oracle cards industry, the Whispers of Love Guidebook is sparse. See above sampling of two card entries, Card 15 and 16 respectively. In fact, I would say you probably don’t even need to read it, whereas with Fairchild’s decks, I would contend that you do need the Guidebook, like the Kuan Yin Oracle, which I’ve reviewed before, or the Sacred Rebels and Journey of Love, two other decks I have that I’ll review at some future point. Fairchild (or her publisher?) 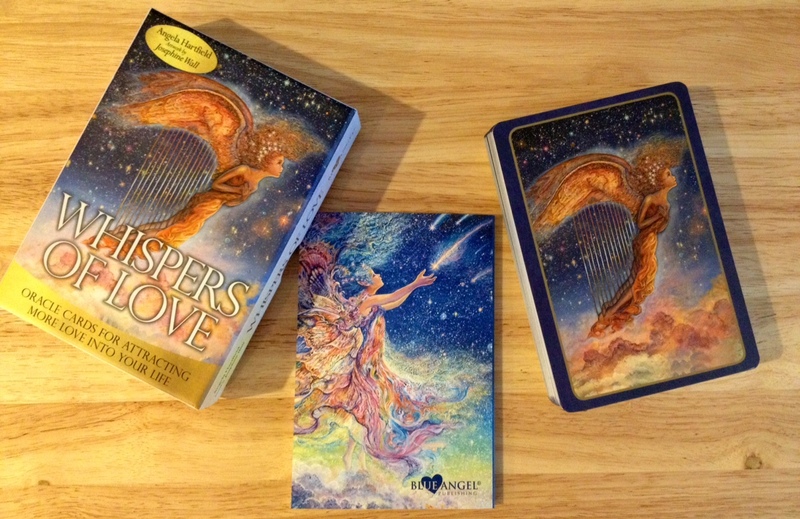 devotes a great deal of diligence to writing out the corresponding card meanings and messages for her decks, whereas here, I would say everything you need to know about any one of the cards in Whispers of Love is already on the actual card itself. The success and popularity of this deck is attributed almost entirely to the incredible synergy formed between combining Hartfield’s messages with Josephine Wall’s artwork. The art is magnificent and if for no other reason, I’d get this deck as an art deck for collecting purposes. Wall’s artwork is surreal, such as in Card 9 where the woman’s hair transforms into winding maze walls with fish swimming around lit candles. She plays with perspective through surrealism, such as in Card 21, seen in the above photograph, with the larger woman’s head in the background behind a hill that features translucent, ghost-like Victorian figures. The card message here? 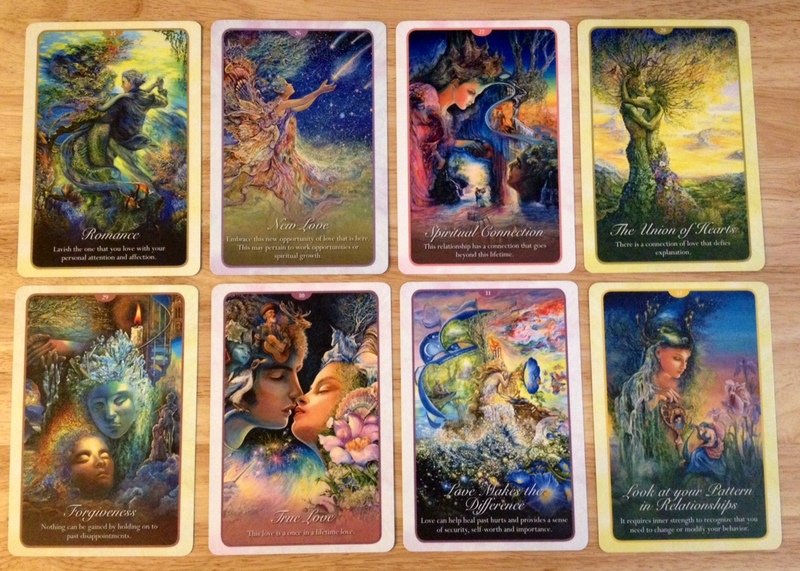 “Choose Love: You always have a choice as to what you should do.” The card art and card meaning don’t fit with each other exactly in the way traditional illustrated tarot decks might, but the art is evocative of the deck’s themes, and that was done seamlessly by publisher, author, and artist. Some do fit in the traditional sense, however. Take, for example, Card 19, “Express Love Through Gifts,” which then features a male merfolk presenting a pearl to a mermaid. Many of the cards feature intertwined couples in romantic love, and unless I missed it, clear male-female couplings. The only ambiguous one is seen above, Card 29. Also, all the human-like (or even fairy-like and merfolk) figures are Caucasian, or look Caucasian, or even when they have blue or green skin, possess Caucasian features. Taken in the context of who these cards are marketed toward, that makes total sense and is what sells, so I’m not actually inserting any personal opinions on that fact here, but did want to highlight it for anyone who might care about something like that. Since I don’t need my oracle cards to be sensitive to sociopolitical movements and multicultural principles, I read quite happily with this deck, especially because the artwork truly trumps all. Here are some close-up images to prove my point. The feathers on the figure’s head that transform into a flock of birds that then take flight into the skies is just mesmerizing. The seamless juxtapositions of day and night, of the different seasons, of land and sea, are beautiful here in this one card. Card 40 is another one of my favorite cards. There is a starseed feel about this one and that surreal juxtaposition of earthly and unearthly is seamless. The cards are also highly detailed and will have you gazing at each one for long periods. They help to in effect transplant your consciousness to a different dimension of sorts. There’s also a naturalistic energy to the cards, again with the seamless juxtaposition of earthly-nature and the cosmic worlds beyond (such as in the preceding Card 40). You may also note all the animals featured are gentle, or associated with gentleness, and that truly is the strongest energy emerging from the Whispers of Love oracle cards–gentleness. 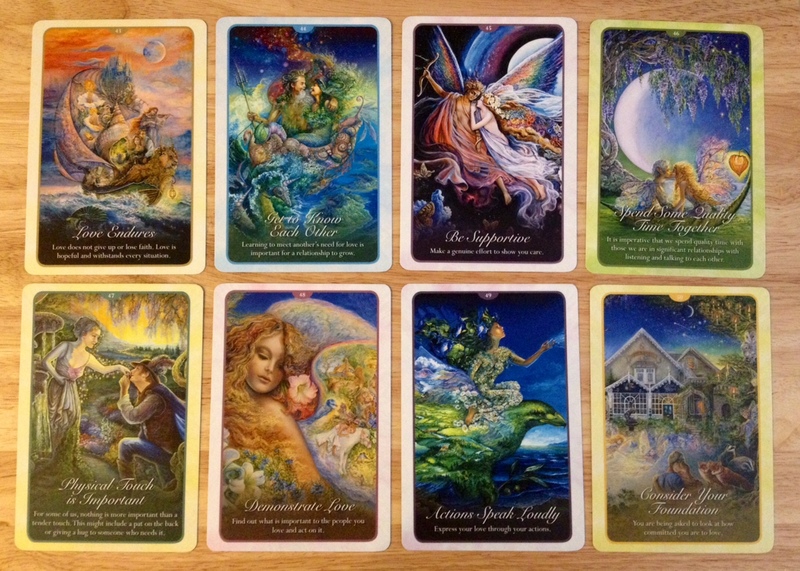 Hartfield and Wall also collaborated on another oracle deck, Nature’s Whispers, which was just released this year, April, 2015, whereas the Whispers of Love deck came out in 2013. 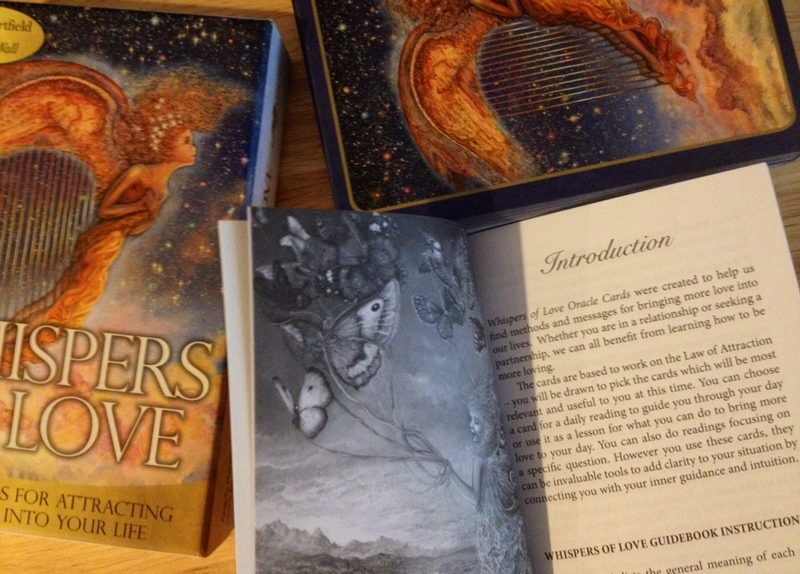 I can’t give an informed comparative review of the two since I don’t have Nature’s Whispers, but just by glancing through card samples online, I’m much happier with the layout and design of Whispers of Love. That said, Nature’s Whispers has significantly less text on each card, and if you prefer that, then that may be the deck to check out. I like the text on the cards, rendering the deck user-friendly with no prior knowledge, experience, or having to consult the companion Guidebook. Plus, the messages can become great daily reminders of how to live with love and compassionate. 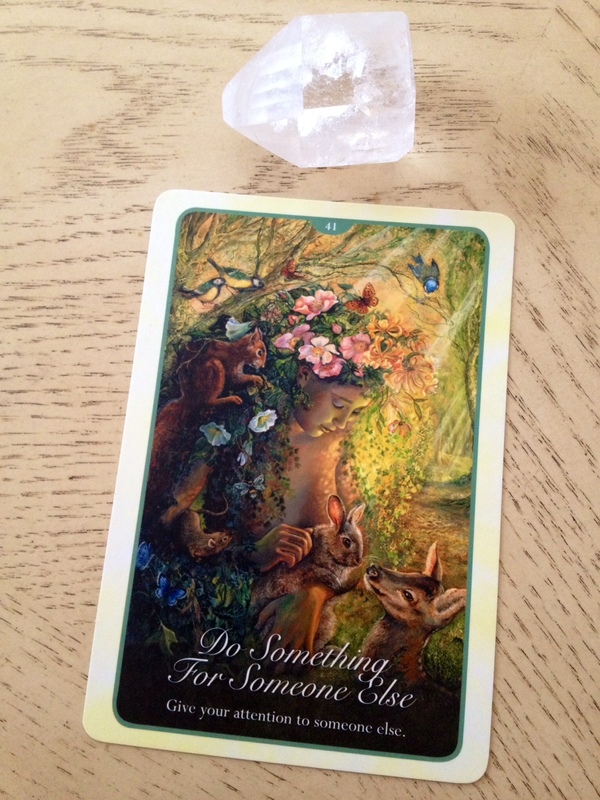 For instance, Card 48, pictured above, “Demonstrate Love,” with the message, “Find out what is important to the people you love and act on it.” The message reminds us to be compassionate. The above shows another sample of the Guidebook for corresponding cards 43 and 44, pictured above. You can see that the Guidebook’s text doesn’t really add all that much more to the meaning of the cards that you can’t already get from the card itself. Thus, I like how user-friendly the deck is and is why this deck would make a great birthday or holiday gift for that spiritual friend. 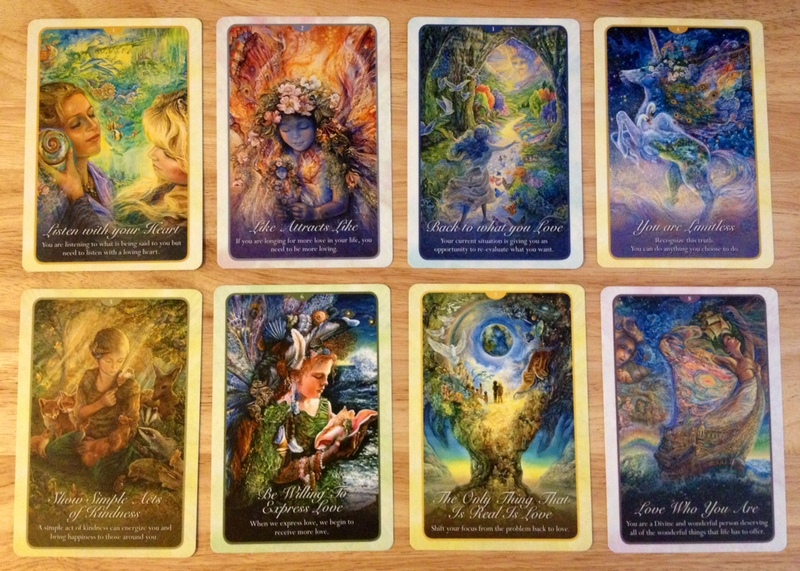 I see this deck as appealing more to the mass, mainstream public, or those who are into fantasy and follow Josephine Wall‘s works. She has quite the global cult following. The Guidebook is useful for its content on oracle cards divination and instruction on a few great card spreads. 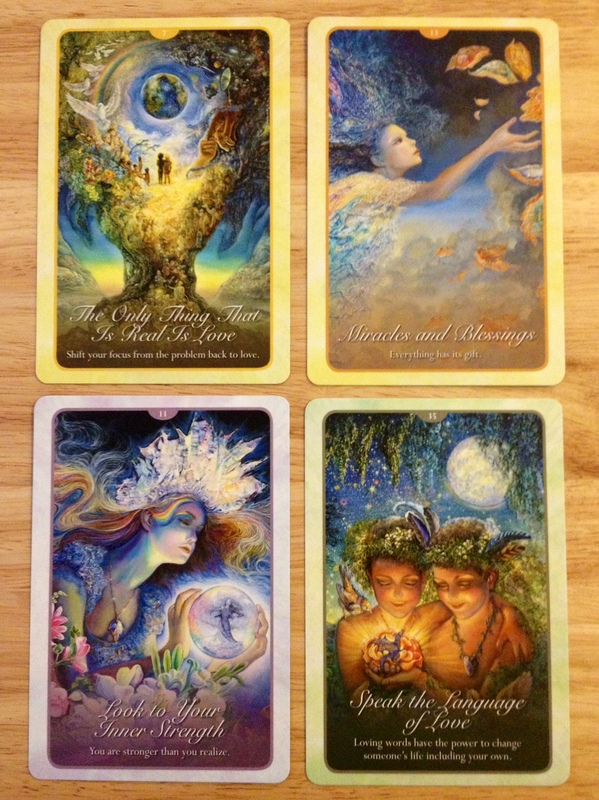 Since the purpose of this deck is for helping us gain spiritual or divine insights into our interpersonal relations, it made sense for me to try out the Relating Spread, pictured above. Card 1 is the top left card. It will express your personal energies and what you’re bringing to the table of this chemistry. Card 2 is the top right card and expresses the other party you’re reading about. Card 3, the bottom left card, expresses the combined energies, the chemistry formed between you and that other person. Keep in mind it doesn’t have to be a lover or love interest. 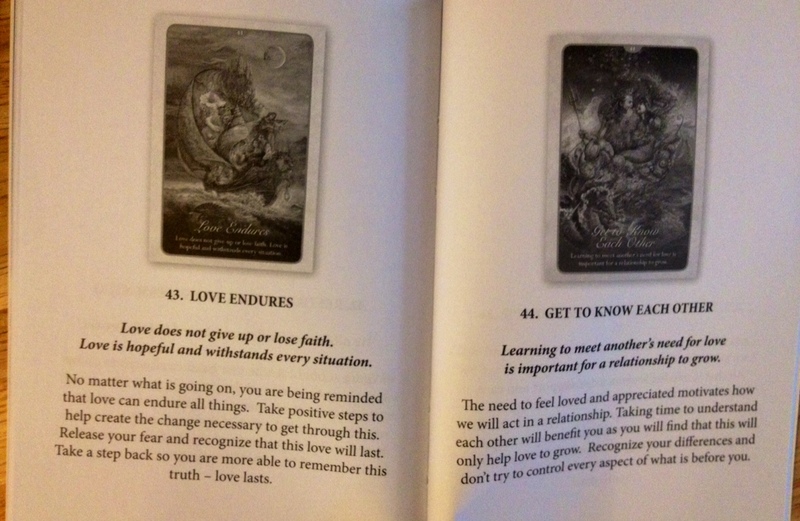 This spread will work for the relationship between any two individuals. You could read about the relationship between you and your cat. 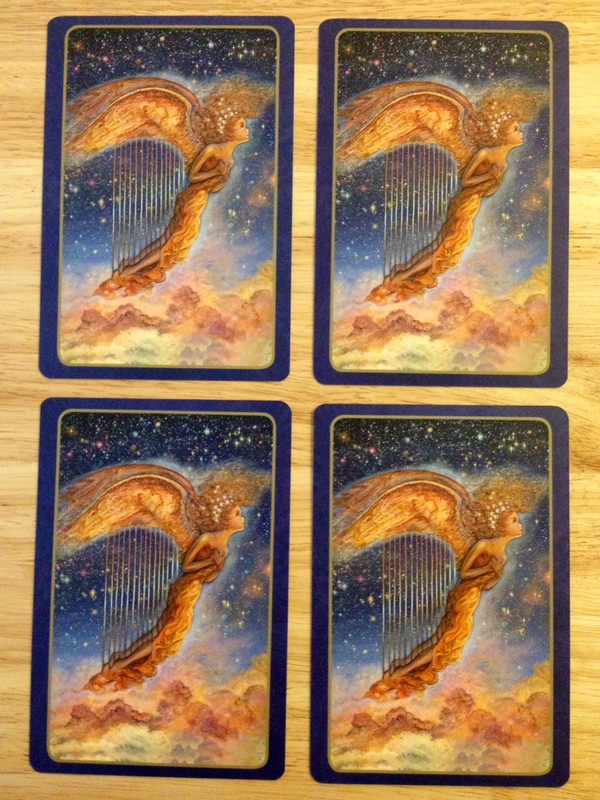 The final Card 4, the bottom right card, is a message from above, so to speak, or words of insight and guidance into this relationship for you to consider. Hartfield’s Relating Spread is truly a lovely spread. Interesting result for Card 1. That may be my life philosophy but then taking it a few steps further. I don’t believe the only thing that is real is love, but with the imagery of the tree there and the world, I’m getting some very strong Key 21: The World card vibes from that card, so I’m happy. Card.. Miracles and Blessings. Wow. Super auspicious and positive and is getting me excited. I guess we will have to see. Card 3 is our chemistry. It’s a bit vague, the way Key 8: Strength (RWS) can sometimes be vague upon first impression when it appears in a reading. Laughing here, I don’t think I’m stronger than I realize, because I consider myself pretty damn strong. ;-D Yeah, Queen of Swords here. 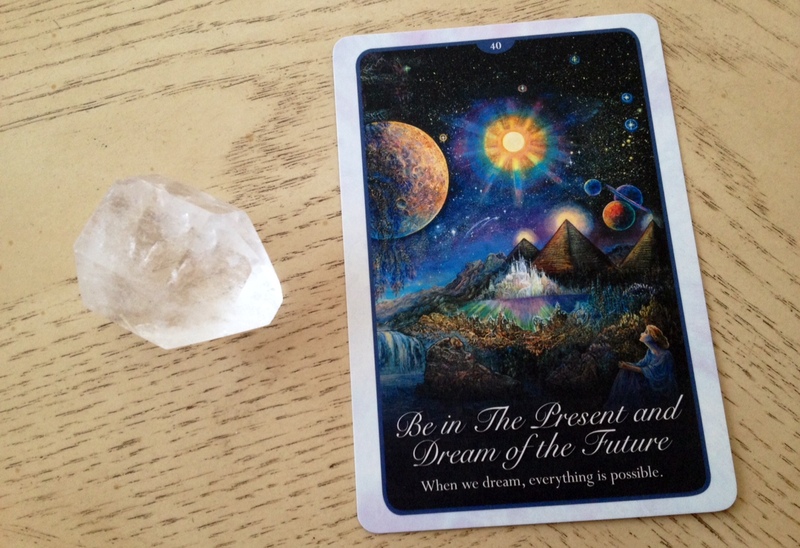 Finally, Card 4, the message to heed: Speak the Language of Love. Guess I should now take back that cocky statement I just made. I do like the message though, which I’m going to interpret per my specific relationship question as the power of positive thinking, of verbalizing affirmations. 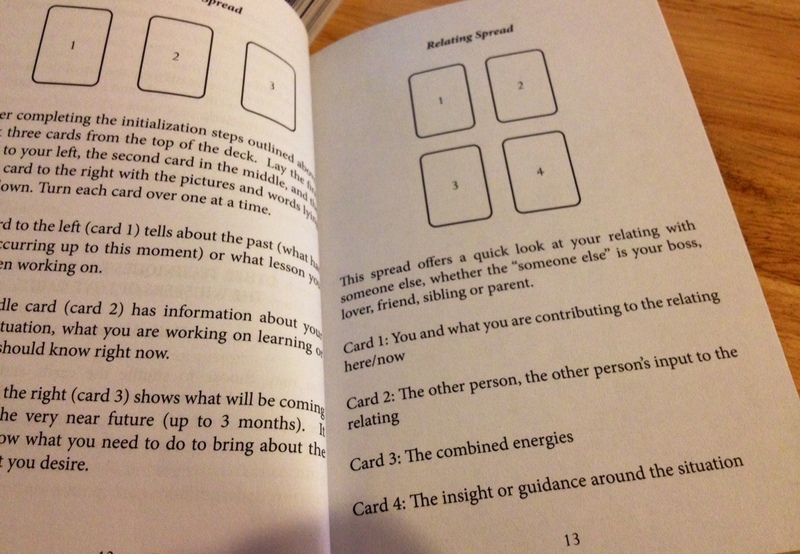 I would say I’m a big fan of Angela Hartfield’s Relating Spread and see it coming in super-useful in reading situations, since we readers all know the vast majority of inquiries we get are relationships related. Mother, brother, husband, ex-husband, child, boss, best friend, or love interest. This spread will work on any interpersonal inquiry at all. And what better deck to use the spread with that Hartfield’s Whispers of Love oracle cards. Fast answers and no tarot studies or cartomancy knowledge required. I also wanted to show the back page of the Guidebook– just, breathtaking. Every one of Hall’s works of art is just beautiful. I really love the choice for the cardback, the golden angel and that surrealist formation of the harp strings, and a view of the galaxy not just full of stars, but glowing planets, evoking the possibility of life, knowledge, and worlds beyond us. 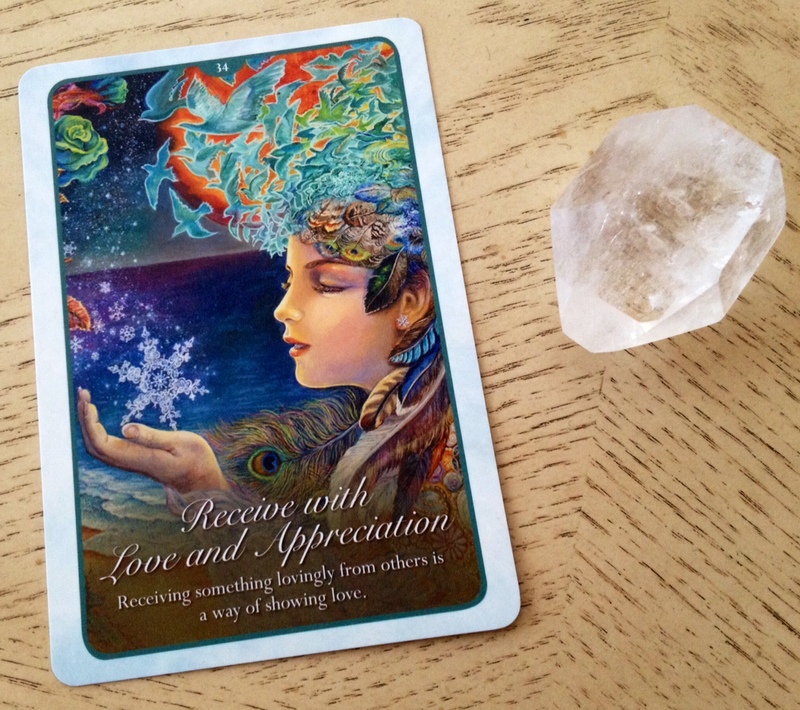 I loved getting to know this deck and see myself keeping it in mind for gift-giving seasons. FTC Disclosure: In accordance with Title 16 of the U.S. Code of Federal Regulations Part 255, “Guides Concerning Use of Endorsements and Testimonials in Advertising,” I received Whispers of Love from Llewellyn for prospective review. Everything I’ve said here is sincere and accurately reflects my opinion of the deck. I’m ordering this deck … great review! Beautiful deck. You’re such an enabler! I was on the fence about this one, but now from these beautiful pictures, I think I need to get it!! Thanks for the great review. Could you please let me know what the ISBN is for the deck you reviewed? I believe there are several versions on the market and some reviews on youtube show cards with much less vibrant colours than those pictured here. The images are beautiful and I’d like to get one of these decks.